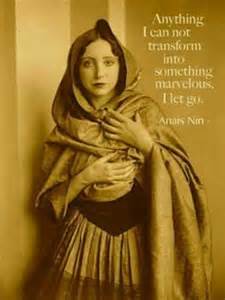 Anais Nin born February 21, 1903 — January 14, 1977. Wow! Thank you, Julaina, for that brief, much-needed peek into the world of Anais Nin. It has been (gosh) two decades since I last read her work and I did not recall her profundity. I suppose I wasn’t able to grasp it then. What a gift! Thanks, Kim, for commenting. It’s good to hear from you. Yes, I saw Anais’s name on a flyer and decided to look for quotes by her. She was unique. Are you going to the San Francisco Writers Conference or are you too busy to write these days? I enjoyed your video. I imagined you would. I do too.